BP has started a UCLA Endowed Scholarship and all contributions will count towards Alumni Association Membership Level, Chancellor's Society Level and Lifetime University Giving. In addition, the first 200 people who commit to donate at least $500 payable one time or in installments over 5 years will become part of the BP 200 Club. They will receive a number between 1 and 200 based on when they make their commitment and these numbers will be proudly displayed on the new, large BP name tags. 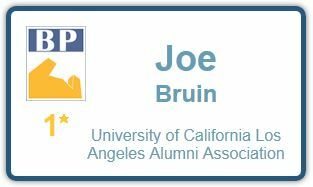 We are looking for 200 generous BP members who are able to commit to at least a $500 leadership gift to endow the Bruin Professionals Scholarship. BP 200 Club members will be recognized at meetings and special events. BP 200 Club members will have a special BP name plate showing your BP 200 Club membership number. Please help me thank the BP 200 Club members listed below. If you are interested in joining this fine group of Bruins, please contact us. Pledge today to lock in your low BP 200 Club membership number! To pay by check, make the check out to "The UCLA Foundation" and note that it is for the Bruin Professionals Alumni Scholarship (#82255e). 5) Eddie Neiman - Castle Funding Corp.
34) Marcus Chang - Guzman Law Group, P.C. 35) Kevin H. Palm - Kravitz, Inc.
38) Roni L. Fischer - RLF Associates, Inc.
44) Leonard Levy - ADR Services, Inc.
46) RJ Przebinda - Gold Leaf Group, a real estate corp.
49) David Cieslak - Arxis Technology, Inc.
53) Todd Moster - Moster Legal Placement, Inc.
61) Daniel Romero - Romero & Levin Wealth Management, Inc.
87) Danny Farmer - Elkins Jones Insurance Agency, Inc.
111) Matthew Crisafulli - ACap Asset Management, Inc.